Part of the 2019 Ideas in Education Conference in LIT-Thurles on Saturday, May 11, 2019. A random discovery I made while listening to "Unbecoming of Age" on Easter Sunday 2019. Snapped by Dingle Darkroom while high on Mount Eagle capturing the layers of the cliffs on the eastern side of the Great Blasket Island during sunset, when two people climbed on the pillbox atop Dunmore Head. I admit, not everybody will have eaten lamb today; lamb is relatively expensive to bu!. I’d bet though that if you did buy lamb for your Easter Sunday roast, you really don’t want to throw away any of that precious meat. This leftover lamb pasta recipe is especially designed for the itty bitty pieces that don’t come away easily when carving. They are perfect shredded into the sauce, browned until caramelised and cling to the pasta in nutty morsels. I’ll keep this short and sweet. The recipe serves a family of 2 adults and 3 children generously. Whatever leftover vegetables you have from the Sunday roast are great recycled in this leftover lamb pasta dish. It is quick to prepare and is very frugal as you’re using up leftover meat from the day before. Don’t be limited to use just using lamb in this pasta dish though, consider using up any leftover meat you might have from a roast such as ham, beef, chicken or turkey! 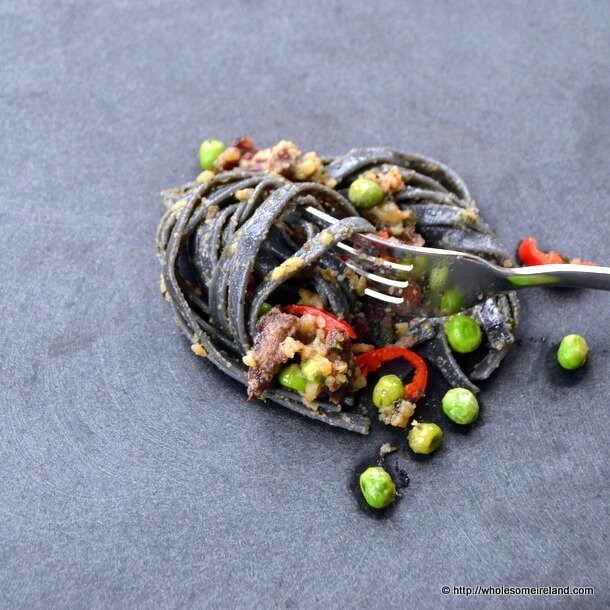 You can see from the pictures that I used squid ink pasta for this recipe. I may have mentioned a few times that I’m clearing the store cupboards? It just so happened that it was the last of the tagliatelle that I had in the house. The recipe will work, no matter what the colour of the pasta, but it’s certainly a talking point. Bring a large pot of water to the boil and simmer your pasta according to the recommended time on the packet. Mine takes 8 minutes to cook which is just about the amount of time it takes to prepare the sauce. In a wide, deep saucepan or frying pan, heat the olive oil on a medium heat. Add the garlic, crumbled crackers and meat. Stir well until they begin to brown. Lower the heat, add the peas and coat in the sauce. If using mint sauce to accentuate the lamb add a teaspoon now. Strain the (now cooked pasta) and add the pasta to your sauce. Stir until completely coated. with the crumbly cracker/garlic/lamb mixture. Season with salt & pepper to taste, then serve with chopped fresh chilli on top. Lovely with a fresh green salad, roasted cherry tomatoes or garlic bread. 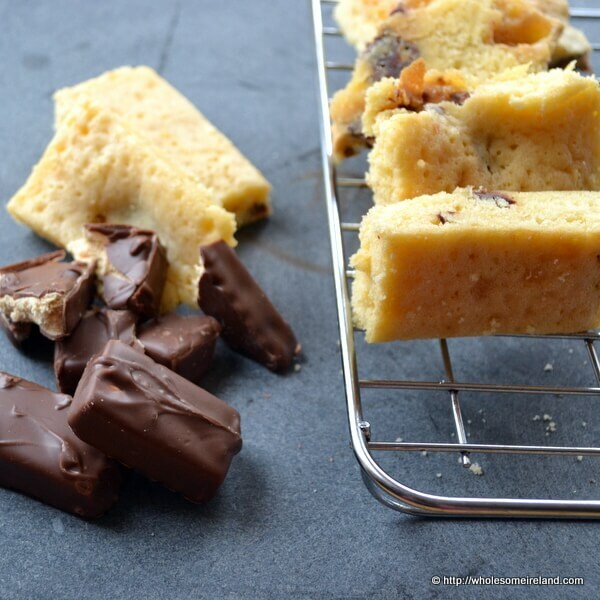 Finally, if you have any leftover chocolate from Easter Eggs you might want to use it up by baking some of my Chocolate Bar Blondies For Leftover Treats (pictured below). These blondies also freeze well so handy for stock-baking for a party or event later on next month. Don’t forget chocolate is grand in the freezer for a short amount of time. If, by chance, you or the kids have received a glut, remove all the packaging (into the recycling bin) and break the eggs into a freezer bag. You can then take out just the right amount when you need it! The post Leftover Lamb Pasta appeared first on Caitriona Redmond - Wholesome Ireland. This Easter Sunday we’ll all gather as a family; my siblings, our partners, our children, and my parents, and we’ll enjoy this classic roast lamb feast. When I say a classic roast lamb feast that’s not strictly true in the Irish sense of the term. The flavours and the food that we will eat together are a reflection of us as a family. The meal speaks to us of a time spent in the Middle East when Dad was serving with UNIFIL and the youngest of us was still in nappies. It’s a meal that we will all contribute to. I’ve already been told I’m responsible for the vegetables, which is really my favourite part anyway. The biggest battle in my house will be to get all the vegetables chopped without the kids depleting the serving platter. The beauty of serving a roast lamb feast in this way is that everybody gets to pick what they like. Some family members don’t like cucumbers, some love peppers; everybody will fill their pitta bread and plates before we sit down together and celebrate Easter as a family. Preheat a fan oven to 180 degrees Celsius. Put the leg of lamb on a roasting tray, cover the end with tinfoil. Score the outside of the leg of lamb with a sharp knife so that you get a criss-cross pattern. Season with salt and pepper. Roast the lamb in the preheated oven for 1 hour 30 minutes. Then remove the lamb from the oven, cover it in tinfoil and leave to rest for 20 minutes before slicing and enjoying. Serve slices and generous chunks of roast lamb stuffed inside of pitta breads with a dollop of hummus, oodles of chopped vegetables, salad, fresh pomegranate seeds, and coriander. Top with thin slices of fresh chilli if you like the heat! Soften your pitta breads by sprinkling with water and microwaving each pitta individually for 20 seconds on high. Leftover lamb meat (if there is such a thing) makes for delicious traditional shepherd’s pie filling. If you have leftover chopped veggies use them to make a stir fry the following day. Disclosure: This recipe was originally developed, written, and photographed for Lidl Ireland. The post Roast Lamb Feast appeared first on Caitriona Redmond - Wholesome Ireland. It will take several weeks to listen to the cross-talk from others who have also read special counsel Robert Mueller’s report. But I know that only a micro-segment of America truly cares about its contents. "No Collusion" and all that. Nonetheless, there exists jaw-dropping details about the inner workings of the administration of President Donald Trump, meetings with foreign officials and plots to affect not only the Americas elections but other elections throughout Western Europe. Trump has business dealings in Ireland and now I wonder if his commercial property evolved after working with relatively unknown developers like in his Moscow dealings. The type of development Trump wanted in Moscow needed Putin's approval. That would have been something Trump needed to keep from prying eyes. Moscow for Trump would have been a mega deal. In fact, Cohen said the Trump Tower Moscow overall "was potentially a $1 billion deal.” Under the terms of the agreement, the Trump Organization would get an upfront fee, a share of sales and rental revenue, and an additional 20% of the operating profit. The deal offered by the well-known Agalarov developers, in contrast, would have brought in a flat 3.5%. For Trump, this agreement promised to be the deal of a lifetime. For a better analysis, I recommend you listen to ProPublica's "Harm to Ongoing Matter". In the meantime, I'm continuing to parse the single section of the Mueller Report that explains how Russia weaponises social media. That's what is in the screen cap above and I will update this blog post with a link to the relevant OneNote content once I've reviewed my edits. I'm capturing the pages by using Microsoft Office Lens and OneNote 2016. Because--you know--Twitter. More inside WaPo. Part of the backyard dig out. None of the discharges used more than 2800 mW when flying and recording on the DJI P3P with Fly Litchi. When the drone cannot find the ground. It's actually three metres above the ground but confused by the clear panoramic roof of the car. Neil Nolan, Adam Mullen, and Rafal Radziwill. We will put archival footage on this blog post after the live stream is finished at 1140. You can join the Zoom Conference at http://zoom.us/j/386174369 between 1115 and 1145 on Saturday the 13th of April. As explained on Spreaker edtech. While making an edtech episode.